8 one bedroom villas, and 2 three bedroom villas are situated at the Beach Resort just 4 km from the tourist centre of Senggigi, and 2km from the Puri Mas Spa Resort. 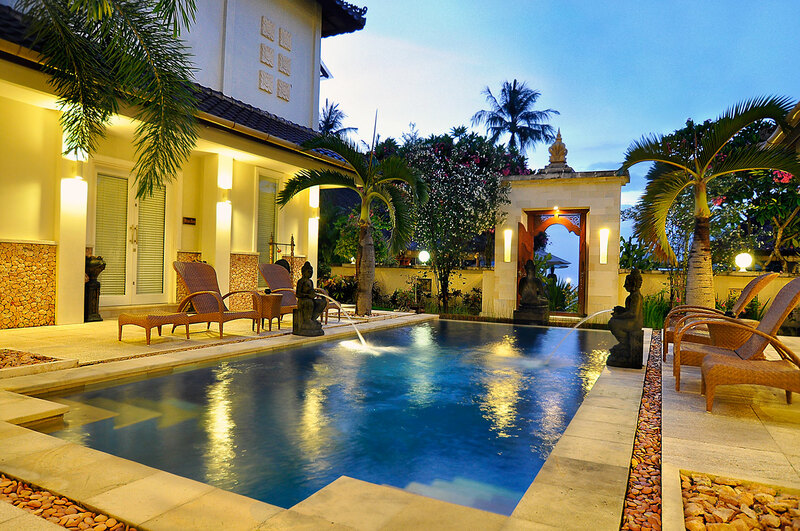 Each villa is set behind walled gardens and each offers their own private swimming pool. 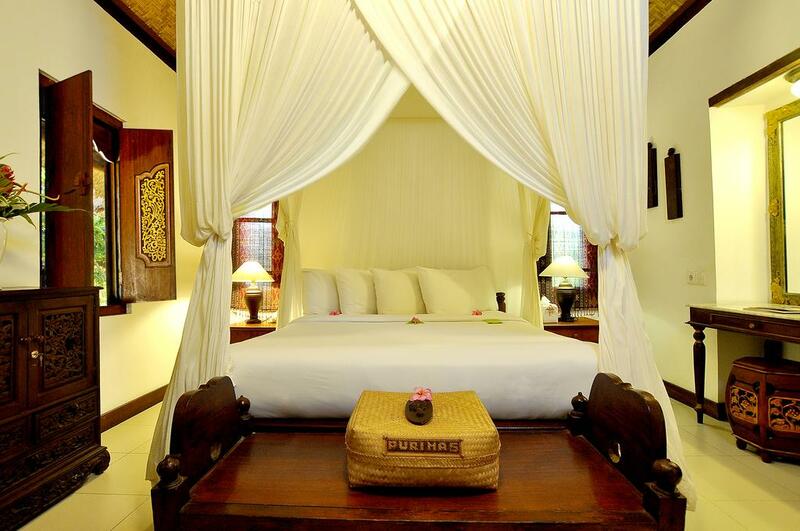 Puri Mas villas provide some of the most exclusive accommodation to be found on Lombok. Only a short step to the large infinity pool with views out over the ocean directly opposite Mount Agung in Bali, and Puri Mas Sunset Beach Restaurant and bar. The private villas are beautifully appointed in a modern minimalist style. Consisting of an opensitting area with kitchen and dining facilities overlooking a delightful private pool in a pretty walled garden. The private pool cleverly separates the living and sleeping accommodation. The large modern air conditioned bedroom complete with king size bed, draped with romantic princess curtains. A day bed is alcoved into the window for relaxing and reading. PuriMas has adopted a No Children Under 12 Years Policy: Each of our swimming pools which includes our public and villa pools are over 150cm deep and one level. Our pools are not attended or gated therefore in the interests of safety we have made a conscious decision to adhere to this policy. Each villa offers approximately 90m2 of indoor/outdoor. It is set behind its own walled garden with a large swimming pool and garden pavilion. A sun patio faces the terrace which runs full length of the villa and enjoys ocean views perfect for sunset gazing and al fresco dining. 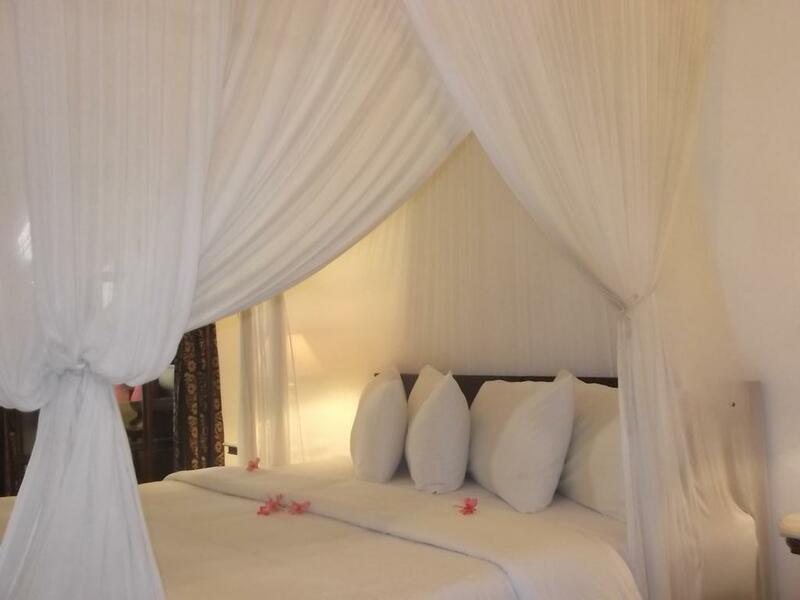 Interior offers three large bedrooms with king beds draped with mosquito nets. 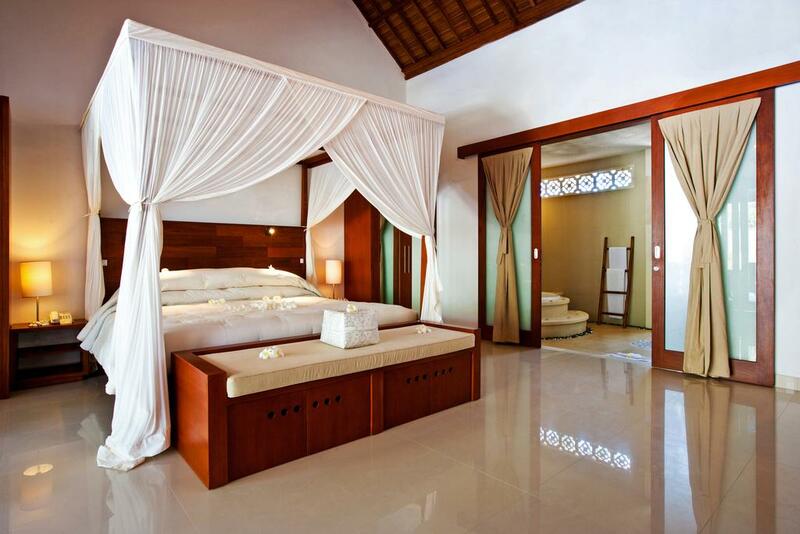 Bedrooms have walk in robes, en suite bathrooms with garden showers. A large sitting room ornately dressed with stately Indonesian carved sofa’s and chairs, gives way to a modern flat screen TV/DVD for those who so desire.